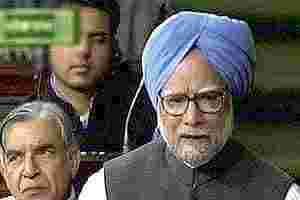 New Delhi: Pushing for passage of the Lokpal Bill in the Lok Sabha, Prime Minister Manmohan Singh on Tuesday rejected demands for bringing CBI under the purview of the anti-graft ombudsman, warning that no entity should be created inconsistent with the country’s Constitutional framework. Intervening in the debate on Lokpal and Lokayukta Bill, Singh dismissed opposition to the provision on setting up of Lokayuktas in states, saying federalism cannot be an impediment in the war against corruption as essential services in the states are the “bane" of corrupt practices. “There are some very special moments in the life of a nation. This is one such moment. The nation awaits with bated breath how the collective wisdom of this House will be reflected in the vote at the end of the debate on the Lokpal and Lokayuktas Bill, 2011," he said. Speaking amidst animated debate that coincided with Anna Hazare’s hunger strike in Mumbai, Singh underlined that the task of legislation was “very serious business and must eventually be performed by all of us who have been constitutionally assigned this duty." He said “others can persuade and have their voices heard. But the decision must rest with us." Rejecting demands for bringing CBI under the purview of Lokpal, he said, “I believe that the CBI should function independently of the Lokpal. We believe that the CBI should function without interference through any government diktat." "As far as the issue of CBI functioning under the Lokpal is concerned, my Government believes that this would create an executive structure outside Parliament which is accountable to none", the Prime Minister said, adding “This is anathema to sound constitutional principles." Expressing confidence that “the wisdom of this House will rise" to support the government’s proposal as reflected in the Bill, he appealed to parties to “look beyond politics" to help fight the “cancer" of corruption in a “holistic" manner. “We must keep in mind the fact that corruption and its consequences eat into the body politic. We have seen how public anger has manifested itself in the last one year," he said, adding “Let us, therefore, endorse this Bill as proposed." He noted that in drafting the legislation, the government has had a wide range of consultations. “We have been enriched by the wisdom of political parties and all shades of opinion have been taken into account." Underlining the supremacy of Parliament, Singh said, “The power of the electorate is the ultimate authority which brings accountability to our democratic institutions. In endangering democracy, we will only be unleashing the forces of chaos where reason will give way to emotion." He reminded the House that “we are creating something for the future in response to the inadequacies of the present. We have to be mindful of the pitfalls when we look into the future."